Welcome to the Seven Streams of Grace! The Seven Streams of Grace (SSoG) is firstly an enormous color poster made up of nearly a hundred artworks with lots of explanatory text. It shows-and-tells the way that every page of the Bible is beautifully woven into a giant masterpiece revealing Yahweh God himself. The location and text of each story-telling artwork on the poster show how each piece fits with every other. This poster can be seen, ‘zoomed’ up close and even downloaded from ‘The SSOG POSTER’ tab above. You can experience the SSoG as a seminar, video-streamed, as a home-school curriculum, as a Sunday School or home group series, or as a devotional guide – all accessed via the DOWNLOADS tab above. This web page explains the whole adventure and includes all the handouts for study and teaching. 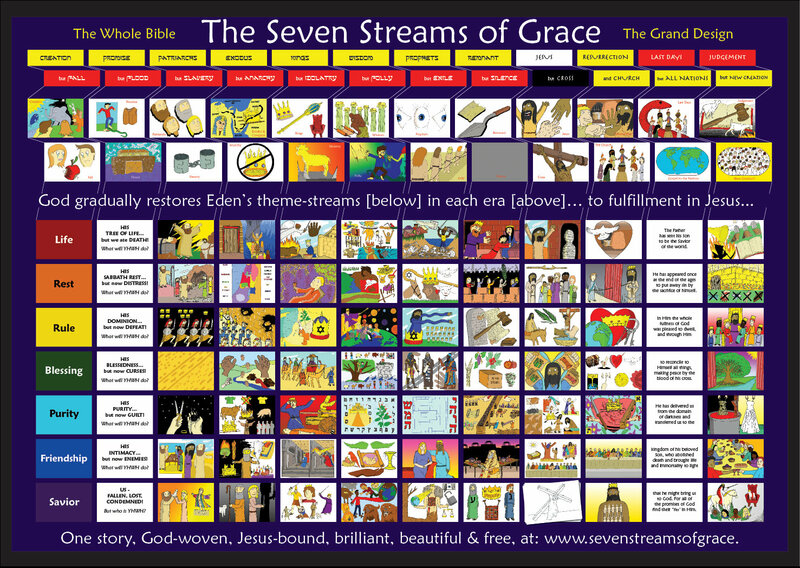 The Seven Streams of Grace (SSoG) shows how hundreds of Bible stories work as scenes within seven great theme-stories that flow through the whole Bible. The beauty of the SSoG is that you will see how all the stories fit together. The SSoG teaches theology the way the Bible teaches it: not via the categories of Systematic Theology, but through networks of stories unfolding, one to the next, patriarchs to the Exodus, Moses to David, Psalmists to Prophets, Exile to Remnant, then finally to Jesus, then to his church, and finally on home! The theology is entirely orthodox, historical, biblical and consistent with all the ancient creeds and catechisms. At the same time, almost every SSoG participant finds the perspective to be a surprise and a delight. How so? Like those ancient works, it focuses on Yahweh God himself. We modern Westerners hardly ever do this. We are culturally obsessed with the power of science and the fantasy of control, so we come to the Bible to ‘distil principles’ and ‘extract practical applications’ for our daily lives. Salvation and sanctification become our personal narratives and quests rather than Yahweh’s cosmic dramas. This ends up making the Bible ‘helpful’ and ‘useful’, but curiously boring because we have made ourselves the center and have put the Bible to our own service. By contrast, the biblical authors want their readers to forget themselves as they find and know God himself in the reading. The SSoG opens the Bible as an epic Story about God and his people, not as a method book for how to keep God happy, nor as an instruction manual for making our lives work (see 1 Cor 15:19!). In order to keep us free from our modernist mindsets, the SSoG explicitly traces the presence and workings of Yahweh God himself in every single Bible text. As people gradually discover that the text is not a religious book, but a historical novel of God, they start smiling. In SSoG workshops, I watch people’s faces change as they see all the stories gradually come weaving together… and so see Him. In fact, as folks recognize the centrality and beauty of God, they do the work of applying the text to their lives all by themselves. They do it out of delight and a desire to participate in the dance of His Triune love. We are transformed not by our own disciplines but as we gaze upon Jesus, so seeing the Father’s heart and history (2 Cor 3:18). We are late-arriving, stage ‘extras’ and bit-players in a glorious, cosmic romance, who suddenly inherit the whole estate! God is great, active, all and only good; he is the loving, potent, bleeding genius above, below, behind, and around it all. The Bible is an epic more like The Lord of the Rings than it is a religious book like the Qur’an. Salvation, sanctification, the message, the story is not about me, and does not come down to me at all. How does a SSoG seminar, class or daily devotion work? Read the poster from left to right, one line at a time, the way you read a book. Think of it as eight epic cartoon stories, each running the full width, each following a different story but all following exactly the same characters, settings and time periods. The top row tells the whole story of the Bible in 24 big chunks. This gives people time-hooks on which to hang all of the stories, poems, letters and teachings that happen on each Bible page. Each of the other rows tell the story of one theme-stream that Yahweh God wove throughout the whole story tapestry to make it come true, over and over, better and better. The SSoG can be done in a 6~8 hour day seminar, or over 8 weeks (one row per week), or over many days or weeks if you unpack each artwork deeply rather than skim across them all. For home-school or daily devotions you could do a page a day from this book for about 95 days, though the top row is better done all at once and a few times over, reducing the total number of days needed to cover the whole poster. Each artwork in rows 2–8 are sized to make one good meal each, needing at least 10 minutes each to grasp. The blank space on each page is for your reflections, presentation notes and prayers. People learn fastest and deepest by having to teach. In seminars the presenter tells the stories across the top line and the first stream, but then people in the room do all the rest! A seminar needs at least eight people to work well (for the eight artworks per row) and in larger groups it is wonderful to be able to tackle each artwork/ page in pairs or teams. Each row is done as a single series of stories over about 45 minutes including 10 minutes of preparation as individuals/ teams, each with a different artwork to study, prepare and present. The MC/ leader/ teacher is primarily a facilitator. Their goal is to get the participants to present the whole program and make the “Aha!’ connections by themselves. However, the facilitator does need to read and prepare to present each picture because people will need preparation help, present confusingly, get tongue-tied or embarrassed, or propose heresies now and then! The end result is a visual journey through biblical history to find that on every single page of the Bible the Creator, Yahweh God, is gradually restoring a set of rich blessings that were lost in Eden and transforming them into something much greater than anything Adam and Eve could have ever imagined. The seven streams are listed on the next page, and then the 24 eras are listed below that. The following page then shows the weaving pattern that runs across each row from left to right… at very high speed! That page (p6) works as a high level summary for presenting the whole top line, M1-M24, as shown in pages 7-30. S1 Life: Adam and Eve were breathed into and became living beings in the image of Yahweh. S2 Rest: Along with the good work they were given to do, there was peace and rest in the Garden, with Adam and Eve walking at leisure in Yahweh’s pleasure garden in the cool of the day. S3 Rule: Adam and Eve were given dominion over all Creation as God’s Vice-Regents to name, employ, enjoy and rule. S4 Blessings: Adam and Eve enjoyed the richest of blessings. The Hebrew text emphasizes the lavish nature of God’s proclamations and invitations for them. S5 Purity: There was no sin, but only cleanliness and naked innocence in the Garden before the Serpent’s arrival. S6 Friendship: Adam and Eve enjoyed intimate fellowship with their father Yahweh in his pleasure garden. CREATION, FALL, PROMISE, FLOOD, PATRIARCHS, SLAVERY, EXODUS & CONQUEST, ANARCHY, KINGS, IDOLATRY, WISDOM, FOLLY, PROPHETS, EXILE, REMNANT, SILENCE, JESUS, CROSS, RESURRECTION, CHURCH, LAST DAYS, GOSPEL to NATIONS, JUDGMENT, NEW CREATION. The eras are shown in this UP-and-DOWN pair pattern to reflect the constantly switching fortunes of the chosen people. It also highlights the dramatic rhythm of the whole Bible story. Yahweh God, the intimately involved author (see the CAPITALS milestones), out-writes each apparently victorious attack of Satan (ITALICS). This regular rhythm is only broken where CHURCH immediately follows RESURRECTION without an intervening ‘downer’. This shows that Satan’s capacity to come back against every good thing God does is fundamentally broken by the cross and resurrection of Jesus. Satan can never catch up again! So how do the stream-themes develop against the eras? The CREATION is Yahweh God’s opening symphony, rich in variety, order, complexity, dynamism and beauty. He gives it all to his children! But Adam and Eve FALL by trusting Satan, betraying Yahweh, and so forfeit all Yahweh’s streams of blessings for us all. For reasons hidden entirely within Himself, Yahweh determines to restore that which was lost, to heal that which was broken, and to make come true all which was dreamed of in Heaven… so he makes the first PROMISE of grace! But sin breeds greater sin until the FLOOD cleanses the earth. Yet Yahweh makes more spectacular and beautiful promises to Noah, Abraham and Jacob. He then delivers each theme-stream to just one man, Abraham, and then to his children, grandchildren and great-grandchildren, the PATRIARCHS (in the book of Genesis). But these gift-streams are all lost in their SLAVERY under Pharaoh until Yahweh makes each one come true for a whole people in the EXODUS & CONQUEST under Moses and Joshua (Exodus to Joshua). But the stream blessings are lost again during the time of ANARCHY alongside the Judges until Yahweh makes every stream come true under the great KINGS of Israel (Judges – Samuel – 1 Kings 10/1 Chronicles). But the streams are lost to Israel’s IDOLATRY until Yahweh represents and embodies each stream in the WISDOM literature (Psalms, Proverbs, etc.). But they are then lost to Israel’s FOLLY until Yahweh paints and sings every stream for Israel through the PROPHETS (Isaiah, Jeremiah, Ezekiel, etc.). But these are all lost in the doom of the EXILE to Babylon until Yahweh brings each stream back to the REMNANT community (Ezra, Nehemiah, Haggai, etc.). But they all dissolve in the 400 years of SILENCE until Yahweh makes them all come true, embodied, pure and contagious in JESUS the God-Man! But Satan and Man kill the Seven Streams of Grace Man, Jesus, on the CROSS. But Yahweh vindicates Jesus the Christ in his RESURRECTION and, in his triumph over every ‘But’ from Satan, Yahweh pours every stream into the hearts of his people, the CHURCH, by His Holy Spirit. But Satan still attacks the streams in his LAST DAYS until Yahweh opens every stream to all the NATIONS. But JUDGMENT will finally fall upon all God’s enemies… until every stream will be consummated by Yahweh God’s in His whole NEW CREATION! Part 3. …plus a few bits on preaching, church history, etc. = THE SEVEN STREAMS OF GRACE! The SSoG outlines 24 ‘milestones’ to lay out a whole bible timeline, and then follows some great bible themes like Life, Rest, Rule, Blessing, Purity, and Friendship, straight through from Genesis to Revelation, showing how all the bitsy stories actually fit directly and beautifully together. The SSoG is a complete Biblical Theology wrapped in art, by heart. = THE DAILY GRACE CATECHISM! The DGC songs cover all the great doctrines that go into the ‘Systematic Theology’ part of a bible degree. There are songs that summarize the whole bible’s teaching on topics like God, Scripture, Man, Sin, Law, Prophets, Jesus, Church, the Second Coming, etc. The DGC is a complete Systematic Theology wrapped in song, by heart. the SSoG uses 100 artworks to teach Biblical Theology. By using the musical DGC, even children and illiterate people can absorb, and then teach, a comprehensive ‘adult’ ST education. By using the artsy SSoG, even children and illiterate people can absorb, and then teach, a comprehensive ‘adult’ BT education. Of course, if you can read, then both projects are a ‘piece of cake’, and you can eat so very much more! Both DGC and SSoG can stand alone. Both can be taught at a level suitable for children, and both can be taught at a seminary level, and even at a level that challenges professors. READ THAT AGAIN. These are adult programs with simplified versions for teaching children. Both are completely free online, and the SSoG has already been translated into various languages. Both have a book for study, teaching, home-schooling, home-groups, Sunday School, uni and college, etc.